The movie, Blood Diamond, traces the path of a large pink diamond found in Sierra Leone in the 1990’s by a fisherman working as a slave in a rebel-controlled diamond mine. That diamond changed and ended many lives and the story of that stone carries a strong social message. The story is interesting fiction but it is based upon facts. The story can help you appreciate how a mineral resource can fuel the oppression and slaughter of thousands of people. This is not a first time phenomenon. It happened before in Africa with ivory and gold. Blood Diamonds, also known as “Conflict Diamonds” are stones that are produced in areas controlled by rebel forces that are opposed to internationally recognized governments. The rebels sell these diamonds, and the money is used to purchase arms or to fund their military actions. Blood Diamonds are often produced through the forced labor of men, women and children. They are also stolen during shipment or seized by attacking the mining operations of legitimate producers. These attacks can be on the scale of a large military operation. The stones are then smuggled into the international diamond trade and sold as legitimate gems. These diamonds are often the main source of funding for the rebels, however, arms merchants, smugglers and dishonest diamond traders enable their actions. Enormous amounts of money are at stake and bribes, threats, torture, and murder are modes of operation. This is why the term “blood diamonds” is used. Map of Conflict Diamond Countries. Yellow countries are where conflict diamonds have originated. Liberia and Ivory Coast were under Kimberly Process sanctions as of December 2006. The flow of Conflict Diamonds has originated mainly from Sierra Leone, Angola, Democratic Republic of Congo, Liberia and Ivory Coast. The United Nations and other groups are working to block the entry of conflict diamonds into the worldwide diamond trade. Their approach has been to develop a government certification procedure known as the “Kimberly Process”. This procedure requires each nation to certify that all rough diamond exports are produced through legitimate mining and sales activity. All rough diamonds exported from these nations are to be accompanied by certificates. These certificates state that the diamonds were produced, sold and exported through legitimate channels. The certification process accounts for all rough diamonds, through every step of their movement, from mine to retail sale. Retail customers buying a cut diamond are encouraged to insist upon a sales receipt that documents that their diamond originated from a conflict free source. Nations who agree to participate in the Kimberly process are not permitted to trade with nonmember Nations. The Kimberly Process is believed to have significantly reduced the number of Conflict Diamonds that are reaching international gem markets. Today 71 governments and several non-government organizations abide by the Kimberly Process. The only two nations which remain under Kimberly Process sanctions as of December, 2006 were Liberia and Ivory Coast. The World Diamond Council estimates that 99% of all diamonds are now conflict free. The legitimate diamond trade provides jobs for over 10 million workers and brings prosperity to areas where this activity occurs. Support of the Kimberly Process by all nations and consumers can convert slavery into jobs and smuggling into respected commerce. The efforts are working. 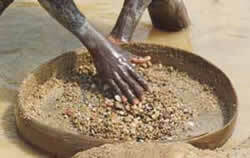 Today, about 99% of all diamonds produced come from conflict free sources..
thanks for the info. Nice put!